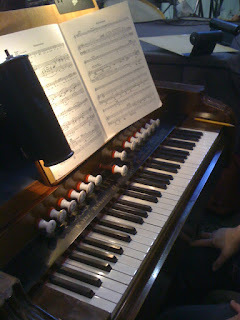 One of the unique things about Ariadne auf Naxos is that Richard Strauss employs a harmonium in his orchestra—a rarely used keyboard that’s similar to a small organ. In this production, Beth Kirchhoff—a trained pianist and organist who also serves as Seattle Opera’s chorusmaster—will play the harmonium. Here she gives us some a quick introduction to the instrument. Can you describe the Harmonium? Basically, the harmonium is a small, home organ. It is totally human-powered, meaning that I have to provide the mechanical energy by pumping the large foot pedals myself—it’s quite a bit of a workout! The sound is akin to a small organ, but also with a bit of accordion quality mixed in. I view it as a lighthearted yet warm sound, totally unique. Kirchhoff playing the accompaniment to the Nymphs' second trio, "Töne, töne, süße Stimme"
The one keyboard is roughly half the size of a piano, and it has several organ stops—flute, oboe, celeste, and English horn sounds. It also has a “Grand” stop that I can pull out to get quite a large, raucous quality, the loudest sound it makes. When would a composer want to use the harmonium in his or her orchestra? Classical composers use it to evoke "old-fashioned" qualities, rather folksy sound. Richard Strauss used it not only in Ariadne but also in Rosenkavalier during comical moments in that opera. It has gone out of fashion in the classical world, but is still popular as a home instrument in India especially. You can't tell in this picture, but Beth has to continuously pump a pedal with each foot the entire time she's playing. Can a trained pianist easily play the harmonium as well, or does it require some special training to play? Most opera pianist/conductors like myself also have some pipe organ training in our backgrounds, so with a bit of "boning up" we can handle this harmonium. 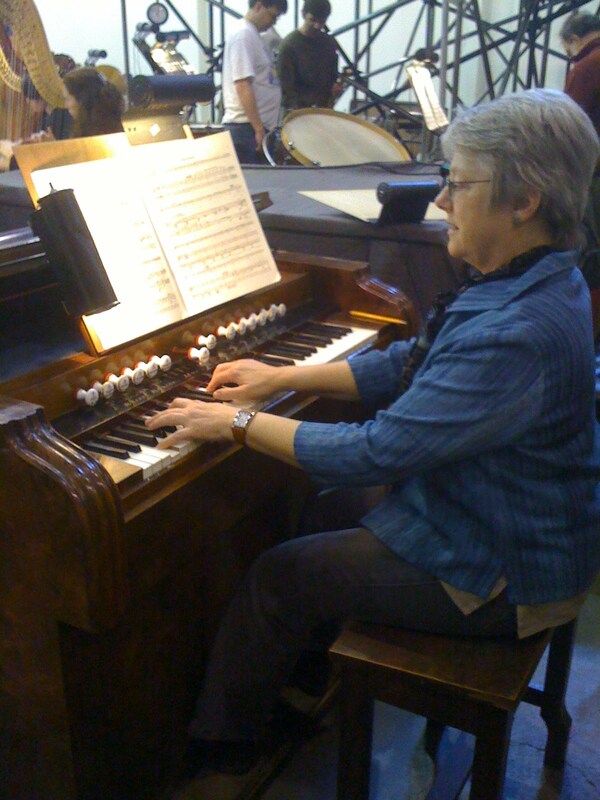 I have played organ backstage at several Seattle Opera productions, and used to have a church job which also utilized my organ training from college days. The actual playing takes a more legato, connected touch than a piano, so it does require some extra practice time for me. One of the great requirements about the opera world is that the keyboardists have a sense of adventure, as there are a variety of musical tasks involved in our jobs. Never a dull evening at the opera! Why do you enjoy working with the Young Artists? Working in the orchestra for the Young Artists Program productions is especially interesting for me, because usually I am in front of the chorus as conductor, not as a player in the pit. I love the ensemble work in opera orchestras, and hearing the amazing young voices come sailing over your head is truly a unique and thrilling experience.